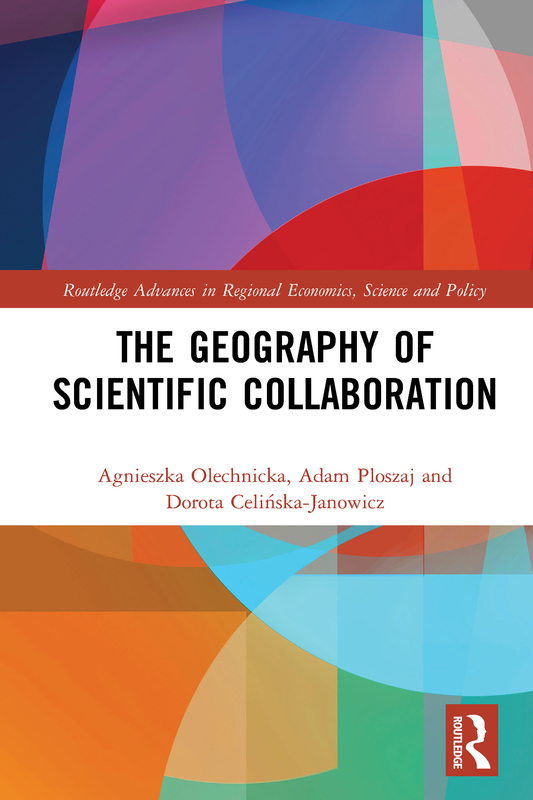 Full citation: Olechnicka Agnieszka, Ploszaj Adam, Celinska-Janowicz Dorota (2019) The Geography of Scientific Collaboration. Abingdon & New York: Routledge, p. 236. Science is increasingly defined by multidimensional collaborative networks. Despite the unprecedented growth of scientific collaboration around the globe—the collaborative turn—geography still matters for the cognitive enterprise. The spatial location and distance between scholars and research organisations affect their likelihood to collaborate and to achieve results that expand the knowledge frontier. At the same time, the developmental prospects of cities, regions, and countries result from, and depend on, their place in the global network of research collaboration. This book explores how geography conditions scientific collaboration and how collaboration affects the spatiality of science. Addressing these questions requires the reconstruction of historical developments that led to the collaborative turn in science, the examination of mutual relations between science and places, and the analysis of spatial patterns of research collaboration at various levels: from individual to global. By combining a vast array of approaches, concepts, and methodologies, the volume offers a comprehensive theoretical framework for the geography of scientific collaboration. The momentous role of collaboration for contemporary science implies that understanding the processes and patterns of research collaboration is now essential, not only for scholars interested in science studies, but also for policymakers and managers of research organisations. Those more practically oriented readers may be particularly attracted by the case studies of scientific collaboration policies from the European Union, the United States, and China, as well as the catalogue of tools for scientific collaboration policy.